First things first: you’ll want to pair the Spectacles to your phone. Open Snapchat, and tap the ghost icon in the top left corner. Next, head to the Settings screen — accessed via the gear icon in the top right corner. Tap Spectacles, and under Pair New Device, select Pair Spectacles. Put the glasses on and look at the Snapcode on your screen. Press the shutter button and the pairing process should begin. If all goes accordingly, your Spectacles and phone will recognize each – in less than 10 seconds – and you will be given the option to name your Spectacles. 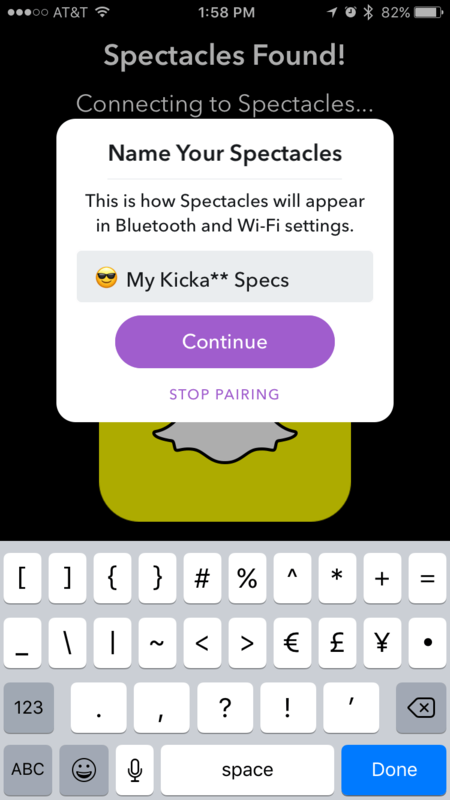 Afterward, Snapchat will finish setup, adding it to your Bluetooth device profiles; in iOS, the Accessories List menu will pop up during initial pairing, and you’ll need to tap on your Spectacles’ name to finish pairing. Overall, the whole process should take about a minute. You can pair multiple Spectacles to your account; just repeat the process. 1. 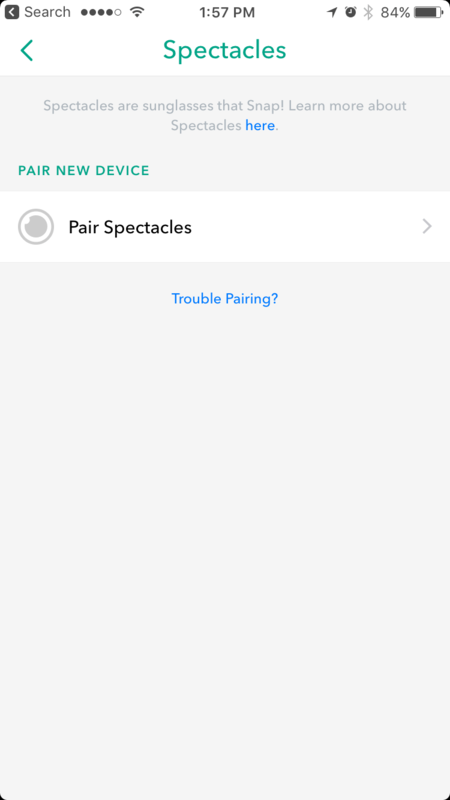 Tap on “Pair Spectacles” to initiate pairing. 2. Stare at the Snapcode, and then press the shutter button. 4. After successful pairing, you can manage it within Snapchat. Interestingly, the Spectacles will also record during the pairing process, so you’ll have a Snap of the setup in your Memories – a reminder of when got your first pair of Spectacles. 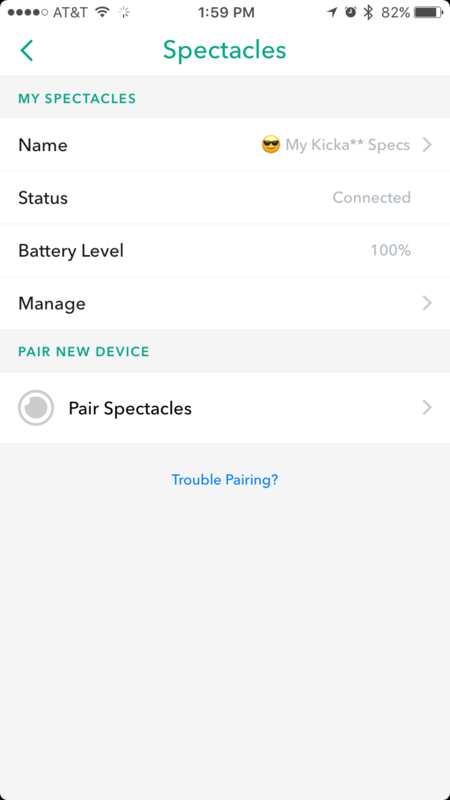 Spectacles can be shared in a household or amongst friends, but before you hand it over, make sure to transfer any remaining snaps to your phone, and unpair Spectacles (in the same Spectacles menu in Snapchat, tap Manage and Clear Spectacles Storage; then tap Forget Spectacles in the same Manage menu). If you forget to import, however, they will remain in the Spectacles’ internal storage and will not transfer to another person’s phone. Spectacles may start deleting older snaps if it runs out of room (it can store up to 200 snaps; a red light will blink as a warning), so keep that in mind. After you’ve unpaired Spectacles, the next person just has to follow the same pairing procedure. Spectacles are like point-of-view action cams, except you wear it on your face. Taking snaps is as easy as pressing the shutter button. Press the button once and it will record for ten seconds. When it’s recording you will see a ring of LEDs spinning. A small light on the inside of the glasses tells the wearer when the Spectacles starts and stops recording; it flashes quickly when there’s two seconds left. There’s no way to curtail the length of a single Snap other than stopping the recording (press and hold for two seconds), but you can extend the recording by another 10 seconds – up to 30 total – simply by pressing the shutter button once or twice after it starts recording. However, in Snapchat’s Memories screen the videos will appear as two or three 10-second segments, rather than a single 20- or 30-second Snap. Ready to review and share those snaps? You will need to transfer (import) them to your phone, and it’s equally as easy as taking a Snap. As long as the Spectacles are paired, snaps are automatically transferred (via Bluetooth) every time you launch the app, which takes about 10 seconds. You can see the status of your imports in the Specs tab of Memories section. Don’t worry if you accidentally close Snapchat during the transfer process – all snaps taken with Spectacles are saved in the glasses until you manually clear the storage, or Spectacles deletes them in order to make room. The Spectacles records snaps in HD or high definition, but the ones that are automatically transferred are in lower resolution (standard definition, or SD). To import the HD version, you just need to tap Get HD at the top. This will take you to another page where you can select the higher quality snaps (by day) that you want. HD imports require Wi-Fi. In Android Snapchat will automatically switch to Wi-Fi (Wi-Fi Direct) to pair with Spectacles, but it will resort to Bluetooth if necessary, which will take longer. With iOS, you will have to manually, when prompt, go to your phone’s Wi-Fi menu in Settings, select the Spectacles (it will be the name you gave it), and return to Snapchat. Once the HD versions are transferred, your iPhone will return to its previous state. There’s no Bluetooth option for transferring HD snaps. The low-resolution snaps aren’t terrible, but they lack the sharpness of HD. Imagine a video shot with a low-resolution front (selfie) camera versus the higher quality rear camera, to get an idea. 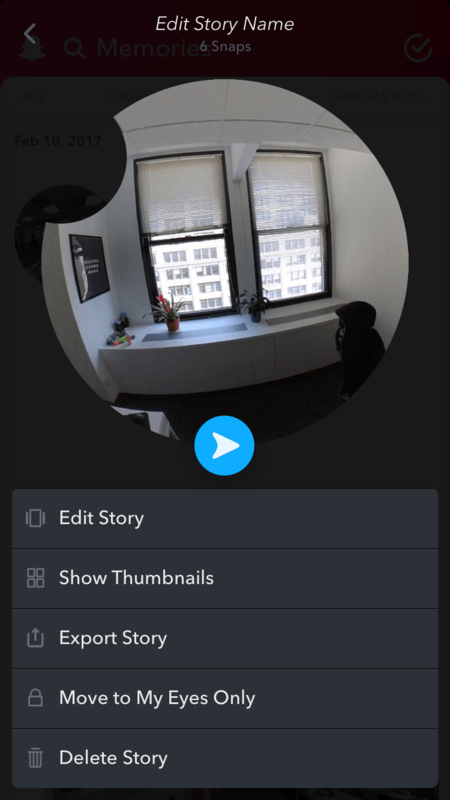 Imported snaps can be found in the Memories section of Snapchat, which you get to by tapping on the small Memories button that’s below the large shutter button. You will find them in the Specs tab – the same place where you can watch the import status. All your Spectacles recordings are sequenced chronologically by time and day, which makes up your story. 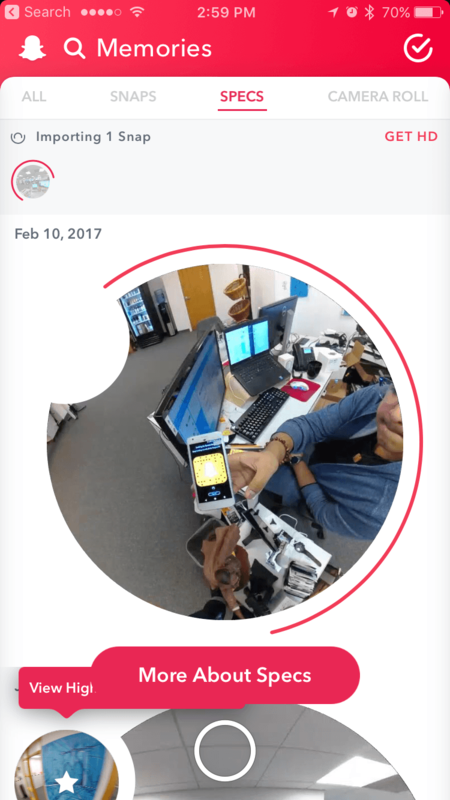 You can view the snaps by tapping on the still image, and then tapping to cycle your way through any subsequent recordings. While viewing, you can rotate the phone for a different view of the Snap. In portrait mode, you’ll see the top and bottom of the Snap, while landscape orientation shows you the left and right. If you shoot a lot of snaps during a day, you can highlight to view only the best ones. Snapchat does this automatically, but you can also pick them manually in the edit function by either pressing and holding on the snap or tapping Edit & Send at the bottom. When you’re done, you can tap on the small, starred circle that’s next to the snap. After snaps are imported, you can treat them just like any snap you’d post on Snapchat. You can overlay text, draw or write on it, and add stickers. Then, you can share with the public or select Snapchat friends to send a snap to. If you’re already a Snapchat user, we won’t go into too many details. 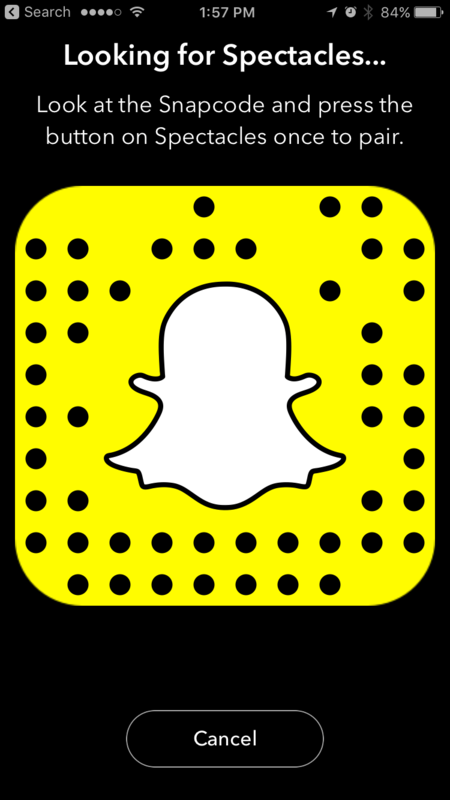 If you aren’t familiar with Snapchat, we have several tips to help you get started. One useful feature in Snapchat that you may not be aware of is a quick menu in Memories. Simply press and hold on a snap, and a menu will appear that lets you share, edit, show tumbnails, export, make private (My Eyes Only), or delete. The thumbnails view is handy for seeing all your snaps in one place, so you can easily edit or highlight only the ones you want. If you export a snap that had been shot with Spectacles, either to your camera roll or Facebook, what you’ll get is a video in a circle. This is what the Spectacles see, versus a video that had been recorded with a phone’s camera. Update: Snap reportedly overestimates demand for Spectacles, has hundreds of thousands of unsold units.